Specific for GSK 3 alpha isoform. Recognises a band at 52 kD. Synthetic peptide: RARTSpSFAEPC, corresponding to amino acids 16-25 of Human GSK3 alpha. Our Abpromise guarantee covers the use of ab9765 in the following tested applications. Western blot: use at 1/1000. 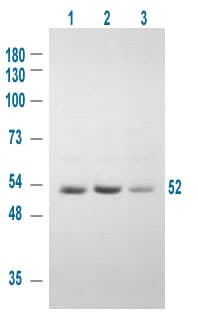 This product has been assayed by ELISA against 0.1µg of the immunizing peptide. A 1/1000 to 1/5000 dilution of the antibody is recommended for this assay. Optimal dilutions / concentrations should be determined by the end user. Implicated in the hormonal control of several regulatory proteins including glycogen synthase, MYB and the transcription factor JUN. Rabbit polyclonal to phospho GSK alpha (Ser 21) at 1/1000 on 293T cell extract shows a band at 52 kD. ab9765 has not yet been referenced specifically in any publications. Publishing research using ab9765? Please let us know so that we can cite the reference in this datasheet. There are currently no Customer reviews or Questions for ab9765.